When you go through narcissistic abuse, you often feel like you’re not good enough. And the things that you are good at have been ignored or underplayed for your entire life. But it’s time for you to embrace your greatness, my friend! 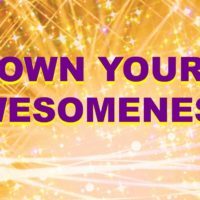 Own your awesomeness – it’s totally okay to be your amazing self! Start embracing and nurturing your true, awesomely amazing self today by using these affirmations to meditate, and then take a moment to answer the three reflection questions at the end – either here in the comments section or in your own personal journal.